So you're not a big fan of camping out...or maybe you are, but it's just not a good time to leave the kids home while you and your spouse take time for yourselves to get acquainted with nature (in more ways than one!) Or, maybe it's winter and frostbite isn't your thing... Put all your excuses aside...camping out at home is sure to be a night you won't forget! Nature Music: http://www.musicalrelaxation.com/free-sounds-of-nature/sound-of-nature/prod_15.html - FREE, 11 minutes long. I set mine up on the laptop which was hidden around the side of the tent. It totally set the mood! I absolutely love this blog! Thank you so much for sharing these awesome ideas! Wow, i love this idea! We've been wanting to go camping for ages but just can't seem to get around to it. There is always others tagging along or some reason we can't go. My husband is going to love this!!! I'm doing this tonight! Thanks so much for the great ideas! Thanks so much for the idea hun! I used this date last night with the hubby and blogged about it here. LOL!! I totally just sent you this idea as a suggestion. Guess I should have searched for it first! I love your site! We are doing the indoor camp out for our date night! 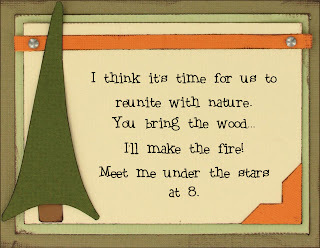 I've already invited him, just need to set up the tent...pick up hot dogs and s'more stuff to cook over the grill and make sure we have the flashlight..... I hope the baby sleeps well tonight! !